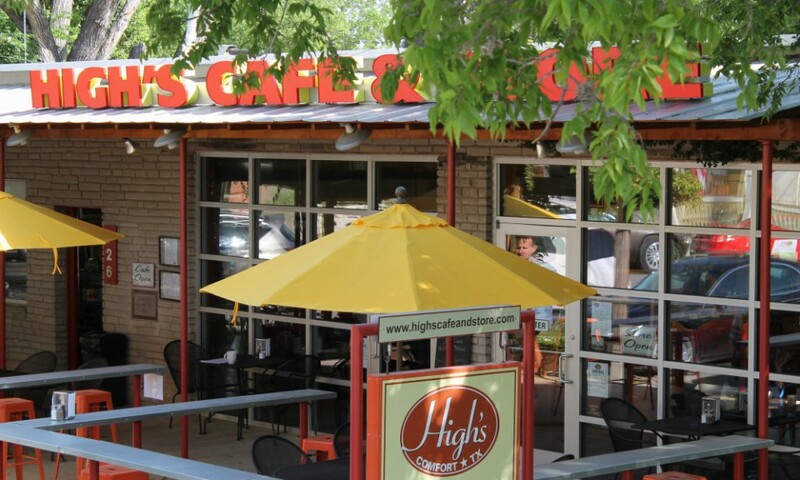 www.highscafeandstore.com I will use this page to list good food finds. Of course we have to toot our horn! Not a restaurant, but a good read…Food Rules by Michael Pollan. Check it out. Again, not a restaurant…but a wonderful show that inspires and awakens possibilities. The magic that results when food, wine and friends meet. “Moveable Feast” which shows on my local PBS station (KLRN/San Antonio) on Sunday afternoons never fails to uplift and move me. From those who raise our food to those who prepare the meal, this show is very special. Give it a look. Sounding like a broken record when I say…not a restaurant but…. a wonderful movie! Saw “Chef” last night and I literally had a smile on my face through the entire film. Please go see this movie. Wonderful actors, great story…if you’ve lost your mojo and are looking for inspiration, then this movie may inspire some action! Big scene filmed in Austin too at “world famous” Franklin Barbeque and Guero’s on South Congress. Delicious and close to my house…Silo Oyster Bar/Dominion...gets thumbs up from every diner at my table. Competent execution from the kitchen, attentive service, chic surroundings and spot on food. Pricey it is, but both visits were a real treat. Delicious starter of fried green tomatoes (super crispy) over dressed arugula and topped with a delicious crab salad. GREAT. Miso glazed salmon over wasabi mashers with grilled baby bok choy. Perfectly cooked, miso had a light touch, taters were creamy with just a spike of wasabi and bok choy was a touch sweet from the grill…all served without pretense on a very warm plate. Servers handled the crowded restaurant with ease. Downside was the dessert. A minor inconvenience in light of everything else. They have a nice balcony, many oysters on the half shell and a tasty selection of small plates for sharing. Check it out. Favorite sushi? Sushihana on Northwest Military in San Antonio. Hands down, my favorite. Try the diablo or dynamite roll. The spice is fresh and hot. Great tempura too – light and crispy. Good service, friendly hosts, and always busy. Check out Feast in King William. I have been there on several occasions and I have always had a great time. The concept is fresh, current and adventurous. Small plates from categories such as “grilled”, “chilled”, “oceanic” and ” heat” are sure to engage your taste buds. A full bar – with clever concoctions – and a great outdoor dining area add to the appeal of this restaurant. Waiters are helpful and knowledgable about the menu and are eager to explain some of their more interesting combinations. With warm weather here, make their patio a dining destination. Linger while you enjoy the lovely King William neighborhood and the clever, tasty food from this thoughtful kitchen. Style without pretense. Hopdoddy Burger Bar at The Rim shopping area is the bomb. LOVE this place. Austin import to a big box shopping center in San Antonio. Beef ground in house, buns made in house, organic produce, ice cream made in house…what’s not to love? Great burger combinations – I love the Llano Poblano – and go ahead and order a large order of fries. Don’t forget the homemade pickles. YUM. Try the Doble Fina Margarita. They are very busy. Try an off time if you don’t want to wait. Or, go straight to the bar. Full service is available there. Great vibe, great food, good pricing. This place is a HIT!!!! Thank you so much Phyllis. I hope you’ll follow our blog. I appreciate your title too. Gotta remember that.